Anyone have experience using this product before? Thanks! I do not see any feedback yet. For $199 you can try and tell us. Pulled the trigger yesterday, I let you guys know, when it arrives. I have been checking about Lensse S3 long time. just a wonder if anyone used with big cine lenses. I plan to use it with rokinon cine . I am not sure yet it is the right upgrade for me ? Any advice ? No worries. It handles Zeiss CP 2 like a champ. Thanks man. You think it would be a good upgrade on my current ff lanparte? Before purchased I have searched online a lot but I could not find so many things just few people discussing to get or not and found some pictures and videos from Lensse. The price was so attractive, then I pulled the trigger. I already have purchased 5-6 ff units back in time. "Ok just one more. This is the last one" I promised to myself. Recently ; i've been using the Lensse s3 dual ff now for a week everyday filming and it has performed very well so far. Beginning I felt very weird about smaller focus wheels that makes me uchhhhh then I used to it in few hours of use. I realised that the smaller focus wheels are advantages most of the time since it provides bigger space on the rig since the unit is duel. ( about %10-15 smaller than others such us lanparte Tilta Fotga ) Also the assembling focus wheels with the hex key pisted me off as well. it is also not a big deal just let kissed rosettes, fix with small knobs and fasten with the hex. 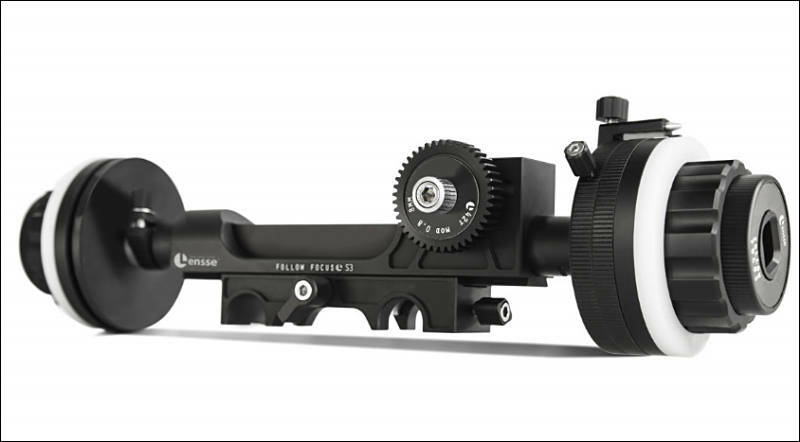 Before purchased this unit I have studied a lot all the options and other duel ff I recognised that oConnor's newest model just came out that almost same with lensse s3 and it doesn't come with swinging arms either. Thought, the additional transmission which is builded in arm causes some little backlash that my budy told me earlier about some high end brands. Also newest model OConnor doesn't have the swinging arm either. Back to the first sight.. Wow.. The product really make me love it that It comes with very cool carrying case all part focus wheels accommodated in nicely. At this price point most of the equipment comes with brown or color boxes. Usually this kind of carry cases comes with very professional equipments sometimes even pay a lot to get such as tool cases. They sell big gear , spread crank and additional marker ring optionally. I did not get either of them but I gonna buy a big gear since my big Fotga gear is not compatible. I would recommend to buy big 60t gear when buying ff and do not pay shipping fee later. Because they provides free shipping for additional parts together when purchase with ff together. I would wish that the unit also came with reverse feature. Unfortunately No... Come on!! Just 199 bucks already got a lot..
A/B hard stops are very useful for most of the filmmakers but I am not used to using them. So I got screws off and put in my inventory. Position indicator is very solid and looks very good. Need very less power to rotate and set in any position. It helps a lot most of the times. The adjustable marking disk is great. It can be 360 rotates freely and set for any position. ( there is a small point on it that helps adjusting position with position indicator) The position indicator and this adjustable marker are just like the good buddies for me use them all the time. The making disks good quality and very easy to take off too. it can be marked and cleaned off easily. Another great feature that if you like to use single ff it can be a single. Just take one side off.. Overall it is my first dual and a decent upgrade on my other ff units. By the way got it even cheaper. Not a bad deal..
Good Call Josh.. This is unbeatable at this price point.. Not a Arri or Occonor yet..
Just receive it. Looks good. Just one side comes with a/b hard stop and marker other side no. The wheels are smaller. Good for me.. i don't like big wheels, looks akward with my dslr camera. Check it more let you know guys.. Thanks for the code!! I forwarded to my pal who plans to get it. I have been using the unit as a primary ff over a month. It is great except few things that though manufacturer already fixed. Anyways the unit works alright and it would be a great future products just need few small things to upgrade.. They have been very responsive to the feedback they got from the first buyers and they are shipping the updated units next week. Very nice they are listening to feedback. I got my FF a few weeks ago, and everytime I have gone to use it I've just ended up putting it back in the box. The small fastening knobs were super annoying and fiddly, but if they improved those it will go a long way to make setup quick and easy. They say the images are coming soon at online shop. This image from Lensse FB page. First look, main differences with S3 .. Main body, drive gear, metal fastining knobs and the feature I liked that metal knob which facing to us that should be a dampaning adjustment.. That is the dealmaker for me. I happy with my S3 however I already asked possibility upgrade my S3.